So we recently had a client who wanted to perform a DR test of their Exchange 2010 DAG. The DAG consisted of a single, all in one server in production, and a single all in one server in DR. The procedure for this test was to disconnect all network connectivity between prod and DR, shutdown the exchange server and the domain controller, snapshot them, and then start them back up. Now, we can all agree that snapshots and domain controllers are inherently dangerous, so its up to you to ensure that you have your ducks in a row to ensure that this doesn’t replicate back to production. That discussion is outside this article. Now, initially they had trouble bringing up the databases in DR, as well as many components of the DAG. This article will walk through an example, and try to make sense of what’s causing these issues. So, here is our setup, we have a two node DAG cluster, stretched across two sites. So in our scenario, we shutdown both PHDC-SOAEXC01 and PHDC-SOADC01. This will cause the databases in DR to dismount because quorum has been lost by the DR server. Now, in a DR “test”, we would shutdown the DR exchange server, and the DR domain controller to snapshot them. I just want to warn you, DO NOT EVER roll a domain controller back to a snapshot in a production environment. This is a purely hypothetical setup. Rant over. After step 3, the database’s should mount, but as you will see, they wont, and I’ll try to explain why. ailed. CreateCluster errors may result from incorrectly configured static addresses. Error: An error occurred while attempting a cluster operation. 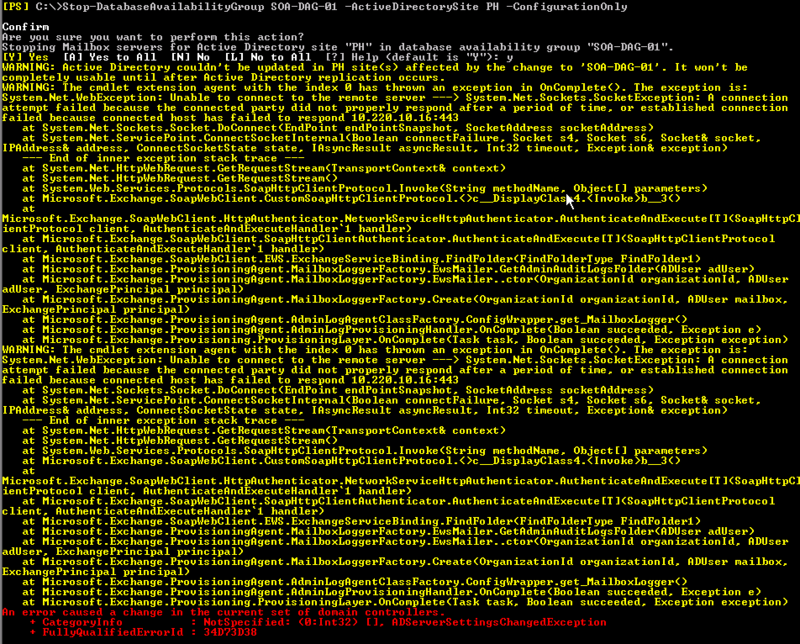 Error: Cluster API ‘"EvictClusterNodeEx(‘PHDC-SOAEXC01.SOA.corp’) failed with 0x46. The Exchange Server checks if it was rebooted more recently than the AFSW, it will not form quorum. So how do we fix? We can start by rebooting the AFSW to see what behavior changes. Now, we see that the WitnessShareInUse is set to the alternate. So, you can see, the testing can affect what occurs with the DR test, but also the setup with the single node cluster can cause this issue. The boot time of the alternate file share witness is also extremely important to what the node can do when it restarts. Hopefully you find the info useful! Happy Holidays to all! I am getting bellow error as going through above article. 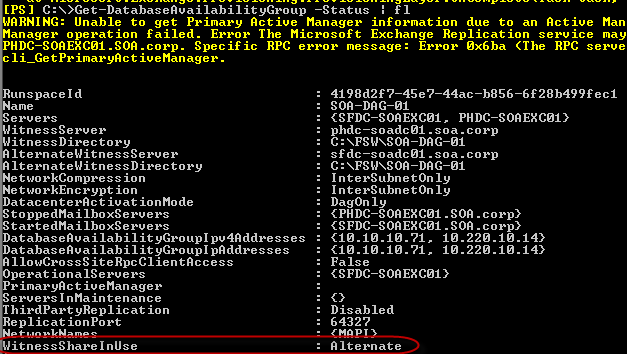 Restoring Mailbox servers for Active Directory site “Site2” in database availability group “DAG”. th servers known to be running. Still to restart DR site after failover it was working but after Restarting DR site all mail databases are unable to mount, unable to form a quorum, An Active Manager operation failed in DR Site and Cluster service in Disable State cause this DAG network not initialise and showing in EMC. Is above article accurate for exchange 2013 as well? Especially when it comes to last remaining DAG member not forming the cluster if AFSW wasn’t rebooted last? Same question as above. Does this apply to exchange 2013? ?